Photo by Fava Design Group – Image courtesy of Houzz.com. 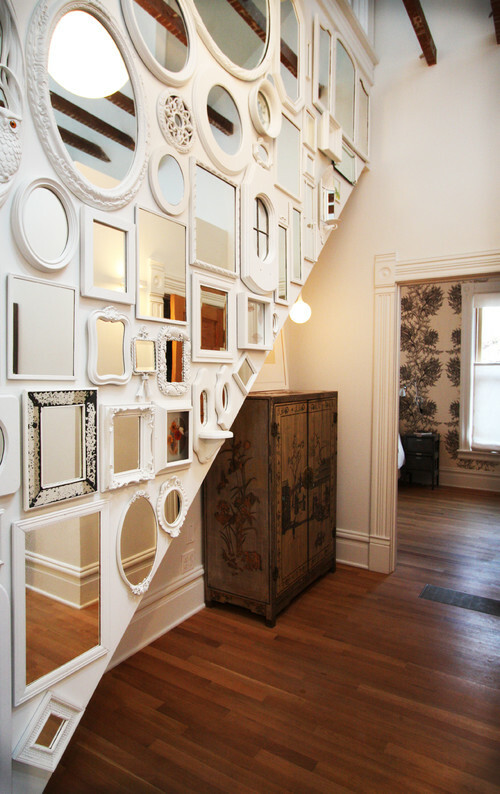 Photo by Caseys Furniture – Image courtesy of Houzz.com. I understand that minimalism is on the wane, and maximalism is on the rise. A natural progression of thesis and its antithesis. Some people do well living one extreme or the other. I, however, think happiness lies in a synthesis of the two, or alternating the two, or having minimalist spaces AND maximalist spaces in one dwelling. 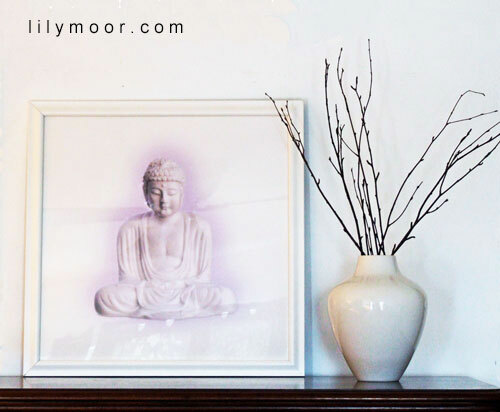 Or re-accessorizing a room frequently when the minimalist or maximalist mood hits. Why must I choose one or another? All or nothing thinking is a slippery slope leading to despair. A calm spot here, an exciting spot there… changing it all out on a whim… that is the formula for me. 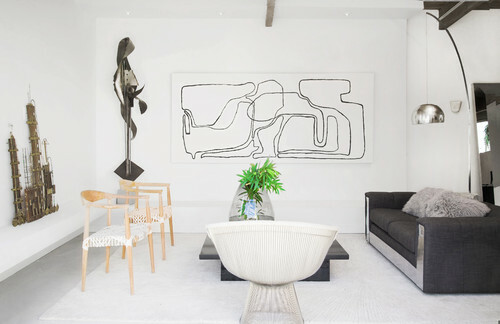 Photo by Lukas Machnik Interior Design – Image courtesy of Houzz.com. I confess to an ill-fated experiment with minimalism. I thought minimalism would give me freedom. However, it wasn’t fun and I didn’t feel free. I purged things that I now deeply regret losing. I now believe in rightsizing the total amount of one’s stuff relative to the size of one’s space. I therefore abandoned my attempts at a disciplined, austere, minimalist lifestyle some time ago. I agree with minimalists in that too much stuff steals your freedom. I just have my own idea as to what is the right amount of stuff. Austerity might look like freedom initially, but then it just looks sterile and alienating and makes my heart sink. The right amount is directly proportional to the size of one’s dwelling and the negative space one needs to feel good emotionally. Period. Not to sound like a minimalist, but too much stuff bogs down your life and spirit. The right amount of beloved stuff, relative to our space and needs, makes the arrangement of objects an aesthetic undertaking, balancing them with the right colors and textiles, rather than an exercise in eeking out endless and ever-inadequate storage solutions. Way more fun. 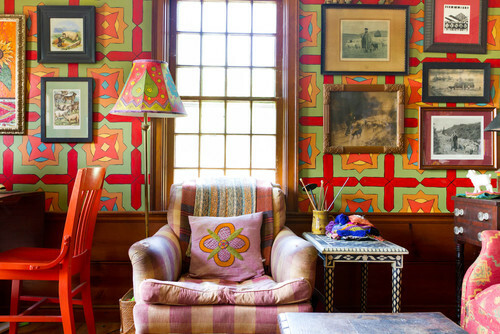 Sometimes maximalism is about a riotous cacophony of stuff that somehow harmonizes, but sometimes maximalism is about a robust palette and an exuberant mix of pattern, and less about the excessive objects. 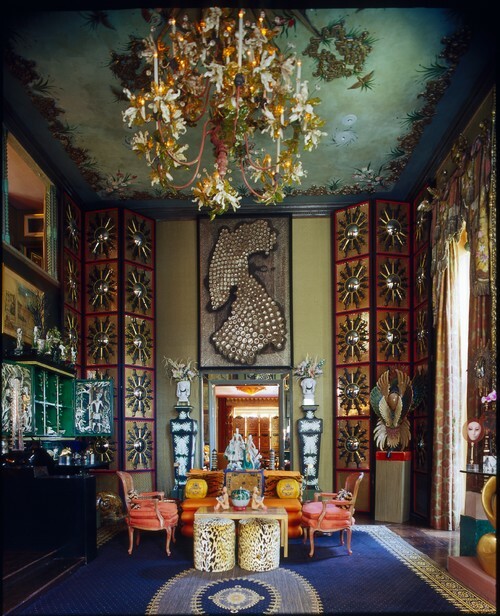 Expressing the maximalist aesthetic is a personal undertaking that needs to be done in a individual way. It simply behooves us to make our choices intentional, and not a result of stuff overflow. 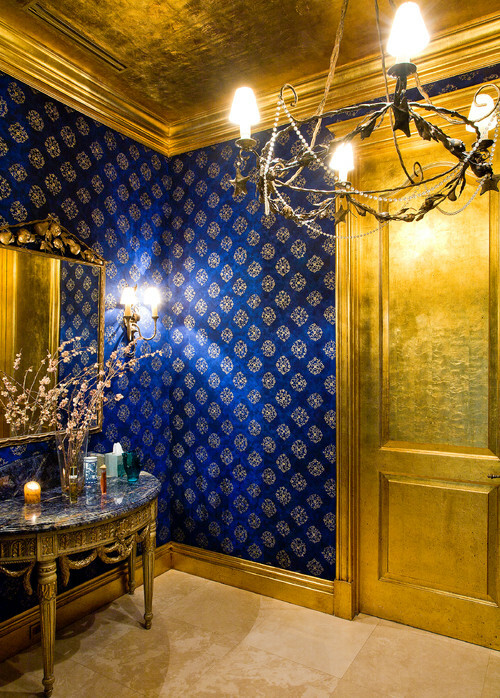 Photo by Drummonds Bathrooms – Image courtesy of Houzz.com. 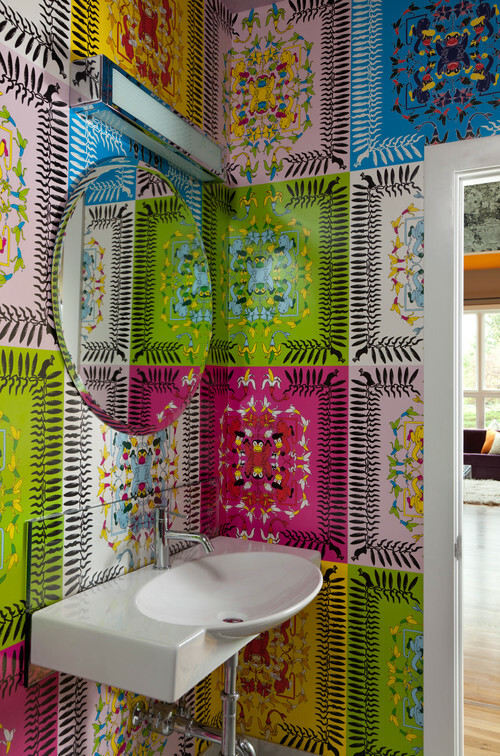 Photo by Hutton Wilkinson – Tony Duquette, Inc. – Image courtesy of Houzz.com. 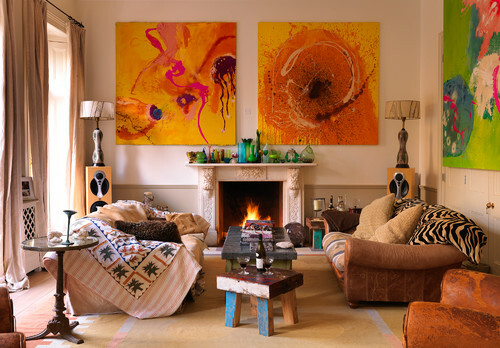 The lion-hearted among us can embrace maximalism in every corner of their home. 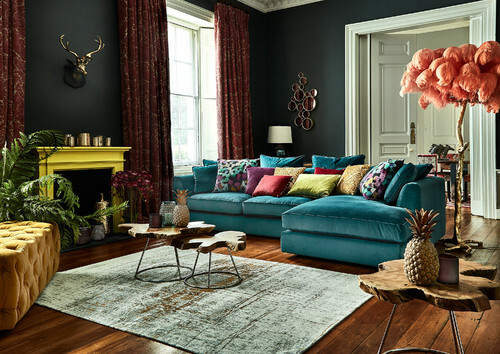 Those with voluminous spaces and palatial homes can embrace maximalism with no fear of overwhelm. Others, who dwell in more modestly sized spaces like me, need to use maximalism strategically so that we can truly enjoy those maximalist visual moments without feeling consumed by them. 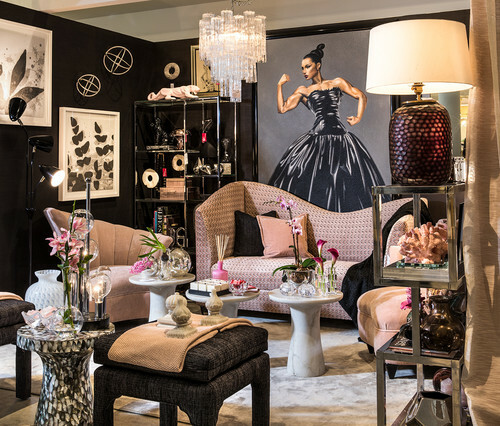 Photo by Mandarina Studio Interior Design – Image courtesy of Houzz.com. Photo by designerpremier.com – Image courtesy of Houzz.com. Those of us who live in a smaller space and have very sensitive nervous systems must approach maximalism strategically. 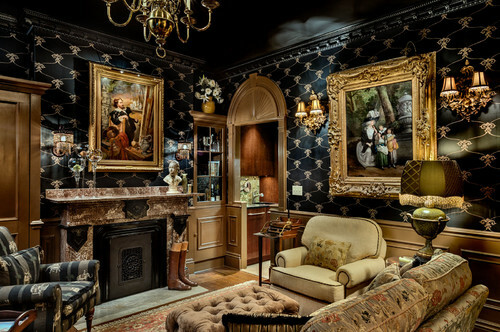 Lavish maximalism works best for me in places where I pass through, or where I spend relatively shorter periods of time. A dining room roaring in color, or a powder room ravished in pattern, are my perfect spaces to express a passionate love for visual excess. These spaces are designed to delight. Quiet reflective spaces can reside elsewhere. 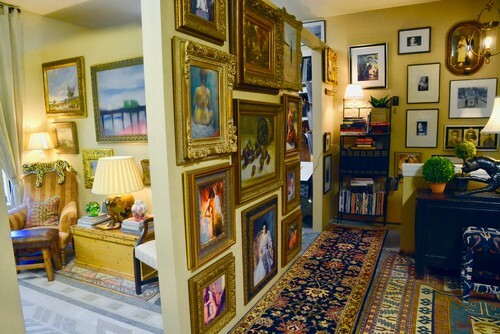 Photo by Roy Campana Photography – Image courtesy of Houzz.com. Photo by bright designlab – Image courtesy of Houzz.com. This is a solution for when we are torn between wanting calm but also not wanting to be bored. Grouping interesting or repetitive shapes in colors that are very low contrast to the walls does the job beautifully. Hence, I feel visually engaged but not overstimulated. I cultivate a collection of white and clear crystal objects to play with, both which create no-contrast interest against my apartment’s landlord-white walls. It may sound extreme, white or clear against white, but one must cater to one’s nervous system and I don’t do it everywhere. I assure you that I love color and do embrace it in some spots. A pure maximalist would surely mock me, but multiple objects in a low-contrast palette is a good way to cater to both maximalism AND my delicate sensibilities. 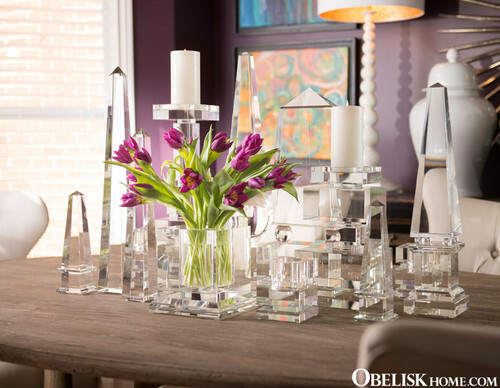 Photo by Nathan Taylor for Obelisk Home – Image courtesy of Houzz.com. Image by Kelly Shea Ellyn. An occasional calm, visual landing place for the eye can be a good thing. Kind of a palette cleanser for the over-the-top visual moments. Photo by TMS Architects – Image courtesy of Houzz.com. 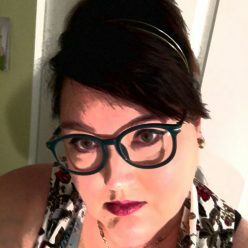 Sometimes I am in the mood for maximalism and sometimes I’m not. There are spots in my house that morph according to mood. This is accomplished by keeping a revolving collection of beloved objects so I can thin or maximize vignettes according to mood. Also, using temporary hanging solutions for pictures allow me to add or subtract pictures from a wall with no damage, and to introduce the right amount of negative space my happiness requires at any given point in time. Textiles are easy enough to swap out and store. Pure indulgence. I recently decided that I emotionally needed more negative visual space, so I rearranged some art and replaced some larger pieces with smaller ones. I also created more breathing room between my beloved pieces of art pottery. Slightly more minimal, though definitely not minimalist. Easy enough. Photo by One Kings Lane – Image couresy of Houzz.com. Photo by Designer Rugs – Image courtesy of Houzz.com. I believe a room has two focal points: the one you see when you enter the room, and the wall you are facing when you most often sit in the room. 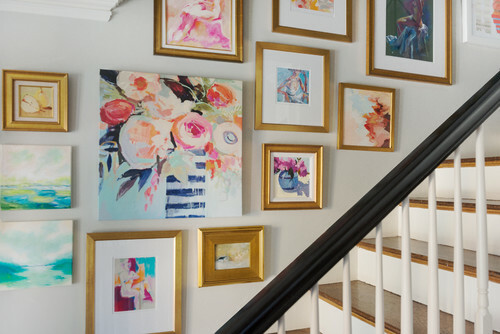 To prevent overwhelm, the walls I look at the most tend to be more restrained in color. The walls that I see when entering a room often merit more drama. The challenge comes in making the room work as a whole. It can be done. Photo by Living Interiors – Image courtesy of Houzz.com. A creative tension of maximalism, calm, and flexibility, let me have my cake and eat it too. That’s how I do maximalism. My things have been naturally and lovingly curated over the course of my lifetime. I make no apologies. I love my things and like to feel that they reflect a rich life. I defend our right to beautiful things, and I aim for peaceful co-existence with said beautiful things. My things have all earned their real estate by being beautiful or useful or iconic or sentimental. Long live things. And exuberance. Photo by Rikki Snyder – Image courtesy of Houzz.com.